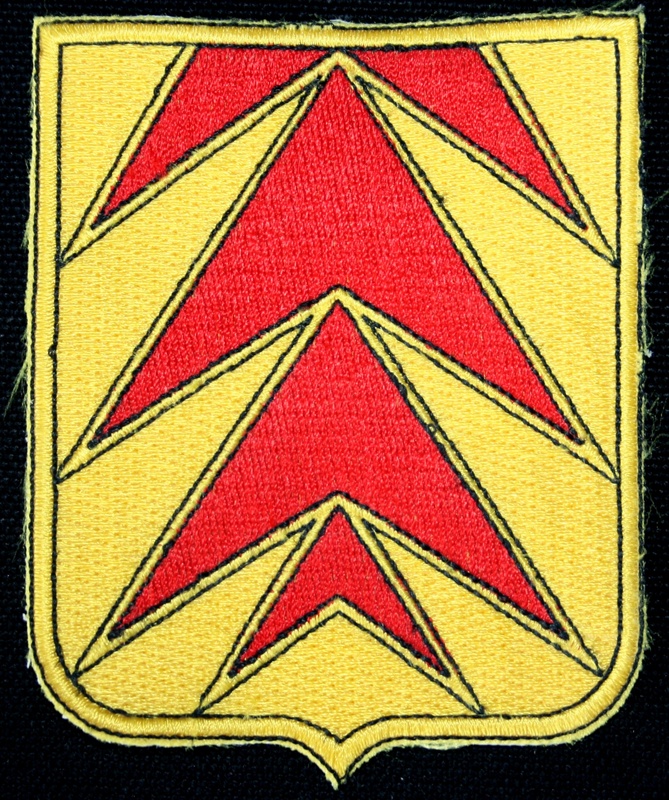 The 681st Glider Field Artillery Battalion (GFAB) was activated on April 15, 1943 at Camp Mackall, North Carolina under the command of Lt Colonel Joseph W Keating by General Order Number 1, Headquarters 17th Airborne Division, and immediately assigned as an organic part of the 17th Airborne Division. · Hq & Service Battery. The cadre personnel came from the 907th Glider Field Artillery Battalion of the 101st Airborne Division, then stationed at Fort Bragg, NC while the Enlisted men were Airborne volunteers coming from various Reception Centers. At this time, the unit figured among 19 Officers and 237 Enlisted Men. 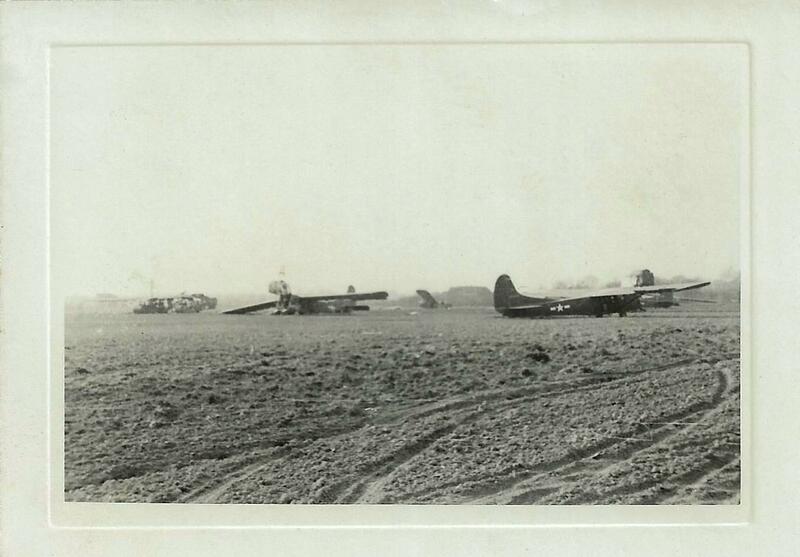 In April 1943, Camp MacKall was a new Airborne formation center not yet completely finished and the first task of the new draftees was to lay out their new home ground. The basic training started on Monday May 3 for fourteen weeks. During this time the young draftees received a basic military education consisting of dismounted drill, weapons, military courtesy, interior guard, care and cleaning of materiel, road marches, reveille, retreat. The men learned to walk under the hot summer of North Carolina! On May 31, the unit had grown and contained 32 Officers and 501 Enlisted Men. The Battalion made a 25 miles march from Camp MacKall to Fort Bragg for two days of Service practice and Special training. It returned at Camp MacKall the next day. All the men made carbine firing for record on July 4 to 6. New march toward Fort Bragg and return on July 23-24 and new carbine transition firing on July 28 to 30. This first step came to an end on August 7, 1943 with a new march toward Fort Bragg. At this time, the Battalion had reduced its strength to 30 Officers and 471 Enlisted Men. After a little break, the new soldiers started their advanced training. After individual military education, it was time now for unit education. On August 23, all Officers and NCO’s received one week of training on loading and lashing Glider and C-47 mock ups. The two first days were dedicated to orientation flight gliders and C-47. On September 1 and 2, the men of the Battalion received infiltration and close combat courses. From September 14 to 16, Battery A was send to Fort Bragg for two days of field problems. Battery B made the same course on September 21 to 23. The whole battalion realized field exercise at Fort Bragg from September 27 to October 2. HQ and A Battery get back to Camp MacKall in a 25 miles march the next day while the men of B Battery conducted their Physical Training test. Week after week, the 681st Glider Field Artillery Battalion became a highly skilled military unit and at the end of this year 1943, the 17th Airborne Division was considered in shape and fit for bigger things. The new year 1944 signaled the end of the Camp MacKall period for the 681st GFAB. Strength of the 681st GFAB during 1943. The end of January 1944 was spent preparing to leave for the 2nd Army Tennessee Maneuvers, the first divisional maneuvers for the 17th Airborne Division! The Battalion moved with the whole Division to the Maneuver on February 3, 1944. For the first time men discovered winter combat condition with cold rain and mud. 26th, 78th and 106th Infantry Divisions also participated to the maneuvers. The maneuvers consisted of series of tactical problems of three to five days with a few days rest following in between. At this occasion, the men of the 17th Airborne Division learned to work with Armored and Air Force components. On March 24, 1944, at the end of the maneuvers, the 681st GFAB was transferred, by motor convoy, to Camp Forrest, Tennessee. The first few days were kept busy with cleaning, scrubbing, painting and repairing equipment. Usual training program started again on April 1. 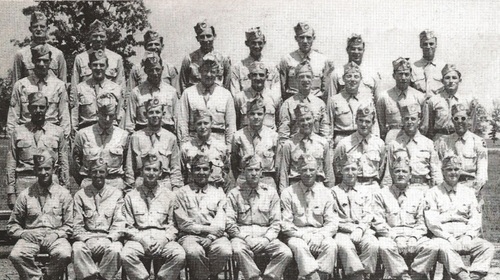 It is during the stay at Camp Forrest that General Miley, Divisional CO proposed at each man of the 17th Airborne Division to be qualified paratrooper. The proposal was saluted with enthusiasm and many members of the 681st Battalion started Divisional Parachute Training School from June 12 to 24. It is finally 6 officers and 105 enlisted men that were qualified as parachutist. It is also at that time all the men were qualified as glidermen and received their glider certificates. The period from July 1 to August 13 was quiet for the men and occupied with usual garrison duties. On August 14, 1944, the battalion packed all equipment and boarded train for Camp Myles Standish, Massachusetts at 20h00. It arrived on August 16, 1944 at 06h45 in great secret. The unit departed Camp Myles Standish for the Boston port of embarkation on August 20, 1944 by rail at 11h00. It arrived at 12h00 and boarded the USS Wakefield. The ship leaved the States for eight days cruise that ended in Liverpool, England on August 28, 1944 at 06h00. The men disembarked the following day at 17h45 and were shuttled by train at 20h00 to Swindon, the 17th Airborne Division staging area. The 681st GFAB arrived at 05h00, before daybreak, on August 30, 1944 in a drizzling rain before moved by convoy to Goddard Estate where Battalion was billeted. On September 1, the usual training started again. This month of September 1944 was affected by a serious training accident. The Battalion departed Swindon by bus on September 11 for two days fire training on West Down artillery range. On September 12, during the training, Sergeant James T Easley, Corporal John W Adams, Corporal George H Wodnick and Private White (no more info) were seriously injured by fragmentation of HE from muzzle burst of shell fired by from 75mm pack howitzer. Sergeant Easley and Corporal Wodnick will be transferred on October 28 as result of non-battle injury. 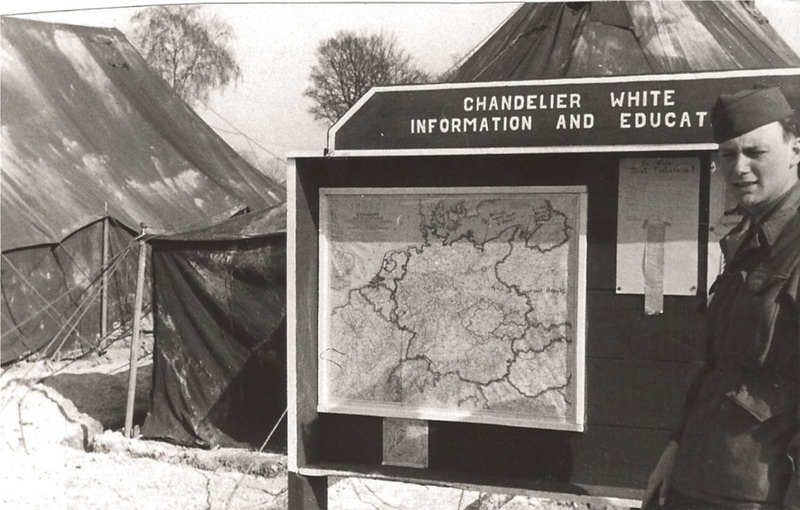 When Operation Market Garden was initiated, the 17th Airborne Division was still in training and was held in strategic reserve. The end of September and the great part of October were dedicated to artillery training at West Down artillery range. On October 28, Battery A and B realized tactical glider loading and flying. On November 15, 1944, the Battalion departed Swindon at 07h00 for Chilbolton Field by motor convoy to participate in Divisional review at 14h30 under supervision of Lt General Brereton, the Commanding Officer of the 1st Allied Airborne Army. The Battalion was returned to Swindon at 18h00. On November 27, the men participated to a combined American and Britain fire control exercise at West Down Artilley Range and on December 2, men of Battery B participated at a glider loading training at Ogbourne St George. On December 6, the whole Battalion departed Swindon by bus to join West Down Imber Range for Divisional Artillery Service practice and simulation of an airborne lift with all combat equipment. Another tragic event in the history of the 681st GFAB occurred on December 17 when a barracks was literally destroyed due to a severe storm. Six Enlisted men of the Medical Detachment were hospitalized and Private James E Reimer (ASN 33257525) died the same day. Strenght of the 684st GFAB during 1944, before the Battle of the Bulge. Following the outbreak of the German counter offensive in the Bulge, the entire 17th AB Division was placed in alert on December 19, 1944. On December 21 at 05h30 the Battalion left Swindon by motor convoy and joined Greenham Common Field, an airport located in the vicinity of Newbury, around 08h30. As soon as they arrived on the airfield, the men loaded their jeeps, trailers, ammunition, guns and all their battle equipment in the C-47 planes. In the morning of the next day, the Supreme Headquarters decided to organize an urgent air supply to save the 101st Airborne Division surrounded in Bastogne. All the available planes were so requisitioned and the men of the 681st were obliged to wait for their transfer. 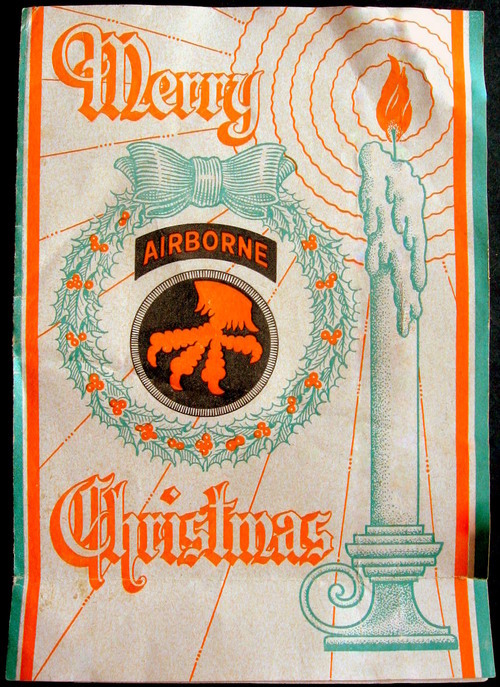 In the morning of December 24, in this day of Christmas Eve, the men received order to take off. They arrived at various intervals at Villeneuve-Vertus, France (airport A-63). On December 25, the whole division was assigned to the 12th Army Group and attached to Patton's Third U.S. Army, ordered to immediately close in at Mourmelon. The Battalion departed so the airfield by motor convoy to the French military camp. 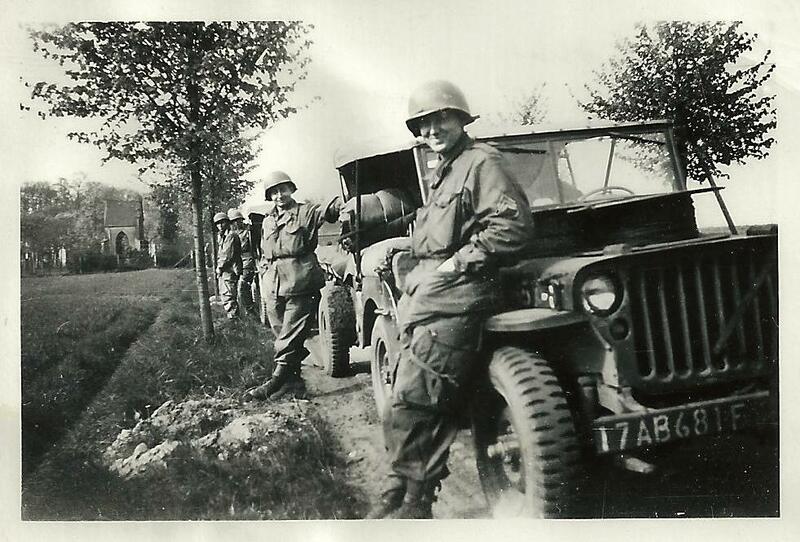 The first war mission of the 17th Airborne was to defend the west bank of the Meuse River. The 681st GFAB left Mourmelon on December 27 at 02h30 to its first combat zone located 3 miles west of the village of Rocroi, in the Meuse department, France. The men arrived in the area around 09h10 and dug in immediately to be ready in direct support of the 507th PIR. The Battalion stayed in the same position until January 2, 1945. There is no enemy action during this time but the men could hear sporadic fire and bombing east of the Meuse River. Winter was cold and occasional snow flurries fell on the positions. On January 2 at 06h00, the 681st GFAB received order to move toward Magerotte, Belgium. The convoy departed at 20h10 but all the roads to the Belgium city were blown or blocked. The men returned so to Vireux for gas and meals. The Battalion leaved again the city toward Magerotte on January 3 at 18h00. It arrived in the little Belgium city around 04h45 under deep snow. It was immediately affected, with the 492nd FA Battalion (11th Armored Division), in support of the 194th GIR who must launch into its first attack again German troops at 08h15. The 681st GFAB opened fire for the first time around 14h00. Two officers were wound this day : 1st Lieutenant Andrew H Thompson was wound by shrapnel while acting as a Liaison Officer and 2nd Lieutenant Charles B Hutchinson fractured one arm while acting as convoy guide. Both were evacuated to rear. On January 6, Private Peter G Maglio was accidently shot in chest by Battery A man and was evacuated. Battery A Commander was shell while returning from alternate position. On January 7, the 17th Airborne was involved in a general attack aiming to break through the German line. The Battalion was in support of the 194th GIR. Sniper fires were reported in the area of the Command Post. 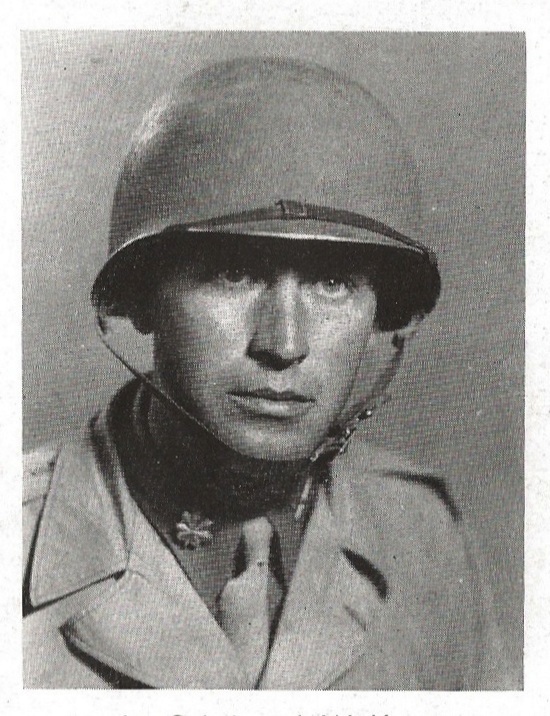 2nd Lieutenant Arthur H Abel was assigned and joined the Battalion this day. After the violent fighting of January 7 that ended in heavy casualties without gaining grounds, no enemy action as reported on January 8 and 681st GFAB fired only defensive fires. Weather remained especially cold with snow flurries during the day. January 9 remained quiet with only enemy artillery fire that felt approximately 730 meters south of the Command Post. The men of the Counter Intelligence Corps checked all civilian people remained in Magerotte. The Battalion suffered another casualty when Private Whitten of Battery B suffered traumatic amputation of the left hand believe to be caused by the explosion of a hand grenade. By the end of that first week of combat the total casualty count was five wounded. The Battalion received at least one replacement. The Battalion didn’t moved on January 10 and 11 and the weather was better with a good visibility in the sky allowing the USAAF airplanes to bomb and strafe the enemy front line positions. The men fortified their positions in sand bagging. On January 12, the USAAF continued their actions against German troops. The 681st GFAB received order to move toward the city of Lavaselle. It leaved Magerotte by motor column at 20h55 and arrived on its new location around 22H03. It stayed barely 24 hours in this position before receiving a new movement order toward Macravivier. The men leaved so Lavaselle on January 13 at 20H00 and arrived on their new positions around 23H00. During the day of January 14, the 681st GFAB received small arms fires without casualty. Patrol was sent out to investiguate but no enemy activity was reported in the vicinity of the Battalion. Once again, the men received a new movement order, this time toward Givroulle and leaved their position around 16h3O to arrive at 17h00. They stayed there until January 17, morning. During this time, detail was sent out to collect dead and equipment. The other men checked and cleaned their guns and equipment. On January 17, at 08h30, the 681st moved toward Mabompré where it arrived around 12h15. Many destroyed German tanks were seen during the journey. The Battalion immediately dug out and setted up defensive charts. It stayed in this place till January 21 when it moved to at 08hOO toward Mauchamps. It arrived on its new position at 09h30 but leaved this new position around 14h14 for joining the city of Tavigny it reached few minutes later, at 14h35. The weather remained cold and cloudy with snow flurries. During this movement war, the Battalion moved and moved again. It didn’t stay in Tavigny more than one day and leaved the little city on January 22 at 16h30 toward Steinbach it reached at 18h30. During January 23, the men joined their efforts with the 274th Field Artillery Battalion to stop enemy action in firing harassing and interdicting fire. January 24 was another movement day and the men displaced their guns to Baraque Dumont. They leaved so Steinbach at 16h00 and arrived on their new location at 17h45. On January 25, the official end of the Battle of the Bulge, the Battalion was in direct support of the 194th GIR during all the day. On January 26, in this first day of its Rhineland campaign, after being in Belgium since 23 days, the 681st GFAB leaved Baraque Dumont in the early morning, at 07h30 and passed the border to joined Hautbellain in Great Dutchy of Luxembourg. It arrived at this place at 09h00 and rapidly fired defensive fire. January 27 was a new movement day. The men leaved Hautbellain at 12h14, arrived at Pintsche at 16h30 and leaved this area at 21h15 for Siebenaler it reached at 21h40. During the next day, men were in general support all the day. At 09h40 on this January 28, one gun of Battery B fired a round into Germany and became the first Battery of the 17th Airborne Divisional Artillery to do that! The men received German artillery fire in response and some rounds landed in the vicinity. On January 29, the men took a new position located in the city of Neidhausen at 16h00, after a 30 minutes travel. The men will stay at this place nearly one week, until February 5, morning. In January 30, while men were very buzzy to check and clean their equipment, friendly 155 mm artillery fire landed within 10 yards of the Command Post without casualty. The rain came with the last day of January. At this time, the 681st GFAB strength was 29 Officers and 320 Enlisted Men, just 3 Officers and 11 Enlisted Men less than in December 31, 1944. In these first days of February, the life of the unit organized itself while it stayed in general support. A rehabilitation program started on February 1 and men were sent to rear area to take a very comfortable hot shower and change clothes. A squad of the 139th AB Engineer Battalion came in the city to clean the buildings from German ammunition and explosives. After that, members of the 681st GFAB putted sand bags on windows and doors of the cleared buildings for protection against German artillery fires. 2nd Lts Olsen and Ober were promoted 1st Lts on February 2. The men of the C.I.C. came in the village on February 3 to screen all civilians people remained in the area. Some details were organized to collect dead bodies around. On this Sunday February 4, the men could assist to Protestant and Catholic Church services organized in the town. The Battalion remained in general support. Other details were ordered to clean up trash in and around buildings occupied by troops. On February 5, the 681st GFAB was in support of the 194th GIR and moved early in the morning; at 07h05 toward Holtzhum, its last location of the campaign, it reached 50 minutes later. Liaison Officers were sent to 1st and 3rd (in fact the 550th AIB) Battalion of the 194th GIR. 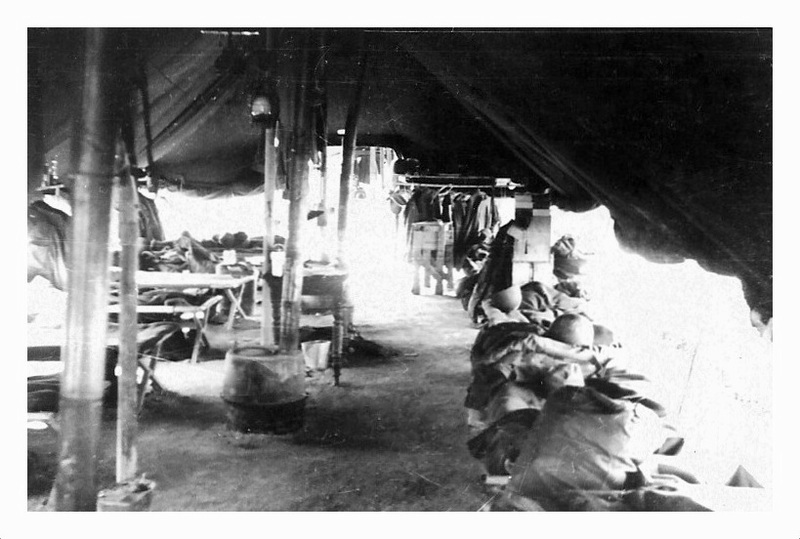 The 776th Field Artillery Battalion helped men of the 681st GFAB in their work. The C.I.C. followed on February 6. Sergeant Moss from the HQ Battery granted a 30 days furlough to the United States. 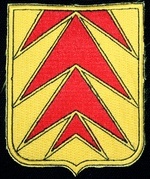 The 776th FAB remained in supporting fire of the Battalion. Approximately 50 men were sent to the rear area for shower and clean cloths. A detail was ordered to gathered German dead in the area, under the constant rain. Harassing and interdicting fires were done during February 8 and 9. 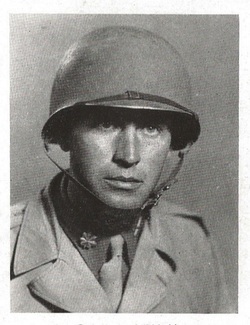 The Battalion received visit of Hugh Schuck, the war correspondent from the New York Daily News journal. On February 11, the Battalion received the mission to support the 1223rd Engineer Battalion and was relieved soon after by the 212th FA Bn (the same Battalion that had relieved the 680th GFAB the same day). That was the end of this first campaign for the men of the 681st GFAB and they received order to prepare their movement to the rear. On February 12, the men leaved Holtzhum and Great Dutchy of Luxembourg, by truck, at 08h30 to the rest camp of Vatry, France. They arrived at destination around 19h15, after a near 11 hours journey under rain. Like the 680th GFAB, the Battalion was finally sent to Soudron (from February 13 to March 19) for a rehabilitation program. On February 28, the 681st GFAB strength was 31 Officers and 392 Enlisted Men. On March 1, under Divisional order dated February 28, the 681st GFAB was re organized under the TO & E 6-227 dated December 16, 1944. On March 7, Battalion participated to tactical and non tactical glider flights. This picture was realized at Châlon-sur-Marne, France in March 1945 by Carl AREND who served with the 681st GFAB (ASN 35174493). It shows the layout of his tent. As you can see, it was a pretty uncomfortable encampment after the fierce battle of the Bulge … (unpublished photo - TFH collection). This is another picture realized at Châlon-sur-Marne, France in March 1945, also by Carl AREND (681st GFAB). The soldier is not identified (unpublished photo - TFH collection). D-DAY ... After the landing. Sunday March 24, 1945. The men of the 17th Airborne have heavily fought during all the day to consolidate the bridgehead on the east bank of the Rhine river. Casualties are important . This photo was realised by Carl AREND (ASN 35174493) from the 681st Glider Field Artillery Battalion during the invasion. It shows gliders of the 681st GFAB just after the landing (unpublished photo - TFH collection). Click to enlarge. "Pee call" during the Germany campaign ! This photo comes from the photo album of Royal W ROSENTHAL (ASN 36808810) / 681st GFAB (Battery ?). It shows Sgt Frank T TOMASCIN, Sgt JONES and Cpl James "Jimmie" EDWARDS Jr (at work). The photo seems to be realized around the last days of the campaign or just after the VE Day (original unpublished photo TFH collection). Click to enlarge. The war in Europe is over and the soldiers savor these first days of peace. During their leaves numerous men have revisited the Wesel battlefield. At this time the place remains unchanged since March 24. 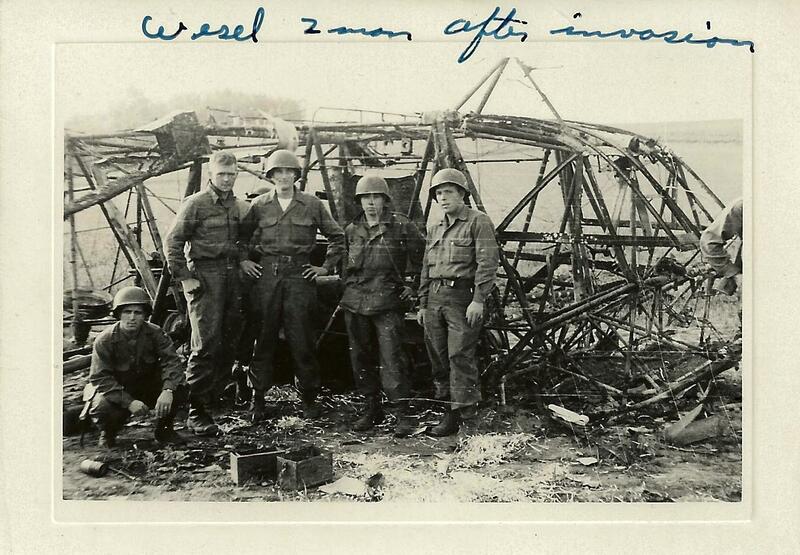 This photo realised by Carl AREND (ASN 35174493) from the 681st Glider Field Artillery Battalion shows buddies posing at the front of a CG-4 glider's remains. This particular glider was hit during landing by a direct 88mm's fire that killed all the men in it (unpublished photo - TFH collection). 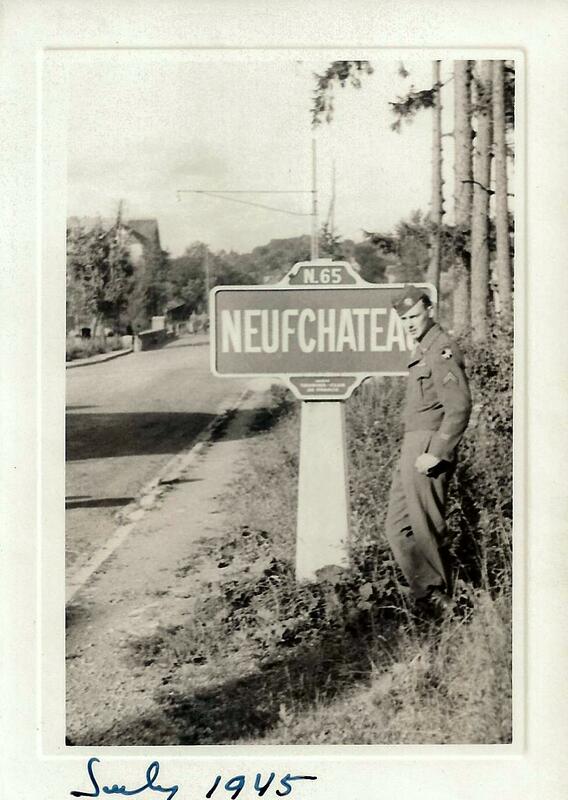 The 17th Airborne leaved definitely Germany in early June 1945 to Neufchateau and Vittel area (France). What other photo can illustrate this ... ? The trooper is probably Carl AREND (ASN 35174493) from the 681st Glider Field Artillery Battalion (unpublished photo - TFH collection).